We get design inspiration from traveling, we are committed to introducing portable outdoor products. 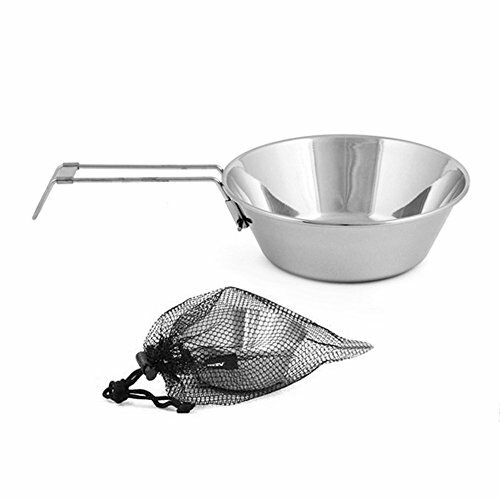 This camping bowl with handle and lid design can be used for any outdoor environment, it is durable and light weight, just take up little space and you hardly feel its weight in you bag. This sierra cup is made of 18/8 stainless steel, it is odorless and non-toxic. Brushed polished inner makes it beautiful and tough, easy to clean as well. The handle can be folded for easy carrying; the edge of this bowl is curled so it is safer for you to use. Its handles and wide tops make it well suited for dispensing food out of a group pot, as well as a personal bowl/plate. You can use it for camping, traveling, picnicking, hiking or any family activities, this bowl can be placed directly on the stove for cooking so it is easy for you to use outside. Size: 4.7 x 4.7 x 1.77 inches/120 x 120 x 45 mm, this sierra cup stacks easily, package include a nylon bag for storage. As the summer approaches, it is perfect as a gift for those who are ready to go adventure.